Sapphire Packaging is a trusted supplier of industrial packaging for companies throughout the UK. We stock everything you would ever require for all your packaging needs, as well as additional items that are vital in any workplace. We take the initiative, to supply innovative products at competitive prices. We listen to our customers, and are dedicated to offering a helpful, convenient and speedy service for all our clients. We are delighted that large and small companies return to us time and again, and that many new customers come to us through recommendation. Our vast product range includes everything from boxes to protective wrapping, tapes to polythene, stretchwrap to strapping, labels to packaging equipment, as well as an exceptional choice of janitorial products, health and safety products and workstation essentials - such as benches and stepladders. From our base in Hockley, Essex, we can offer fast dispatch throughout the UK. We can even create personalised packaging products to match your brand, if required. If you cannot find what you are looking for on our website, please contact our friendly team on 01702 205 999 and we will be able to help. Sapphire’s selection of flexible, easy to use foam edge protection is ideal for protecting tubes, corners and edges of furniture, glass, worktops, cupboards, pictures, mirrors and doors. It boasts high impact protection, is quick and easy to use, is strong and lightweight and is also 100% recyclable. We stock four main shapes: profile edge, profile, u-corner profile, and ‘o’ profile, for pipes and tubes, which is also ideal for insulation. Each shape comes in a choice of foam thickness, in packs from 80 up to 600. Click on the link to view a full table of sizes and details for each option, or contact us on 01702 205 999 if you need any assistance. Procell is one of the leading brands in protective foam packaging, and is a very popular product for many of our clients. We stock Procell, as it offers the ultimate protection for delicate or coated surfaces such as glass, polished furniture and other painted surfaces, and means you can easily transport such items whilst maintaining their original condition. It can even be used to effectively lay laminate flooring. Procell is soft, strong, environmentally friendly, recyclable, CFC-free, and is highly effective in protecting from scratches and abrasions. It comes in a choice of four thicknesses, from 1 to 4mm, and five different roll widths; from 600mm width by 300m in length, through to 1500mm in width by 75m in length. Click on the link to view our table of all available choices. Power pre-stretch film is ideal for pallet stabilisation, as well as for use with dual roller power-pre stretch machine systems. It is also compatible for use with Obritwrap machines, and can be used for a wide variety of products. It offers up to 300% stretch, which makes it extremely cost-effective and space saving when storing. Our choice of cast machine film-power pre-stretch material comes in clear or black, and comes in 500mm widths in lengths of 1700mm, 1500mm and 1400mm. Click on the link to find out more, or contact our helpful team on 01702 205 999 for more information. We highly recommend e-tape plus, and it is one of our most popular tape products. The premium quality tape is specially designed with 150m length rolls, to reduce roll changes and provide space-saving, with 127% more tape on each roll. It is premium quality, offering a strong grip, and is available in 4 grades. It is lightweight, reduces waste, and you will receive a free dispenser with your first order. From just 33 pence per roll for the equivalent of a standard 66m length, it is fantastic value for money and offers great performance. It comes in a choice of brown or clear, and our boxes come in volumes of 36 rolls, and the more boxes you order, the more you will save. Our selection of durable Eurofit double wall cartons are the ultimate solution for perfect pallet loads. They are specially designed to fit exactly onto standard Euro pallets, ensuring you maximise space and value. They offer increased pallet stability during transit, and the double wall makes them strong and thick with newly improved presentation. Choose from our six available double wall sizes, in 286 x 252 x 305, offering 12 per full Euro pallet or 6 for a half Euro pallet, up to 786 x 386 x 472, offering 3 per full Euro pallet. Click on the link to view prices and volumes for each size option. Sapphire Packaging are able to offer a selection of bespoke printed cartons, to personalise each box with your company branding and logo. This gives a highly professional finish, and enables promotion of your company as well as a practical solution for safe transportation of your products. Our bespoke options are ideal for business to business shipments, or for mail order products. The bespoke corrugated cartons ensure come in a wide choice of sizes and styles, to best fit your product. Getting the size exactly right means you can reduce other packaging costs, or even eliminate internal fillers. Our dedicated design team are able to offer a bespoke design for your company. You can choose your style, size, board grade, colours and quantity. Speak to us today to find out more, on 01702 205 999. Our postal tubes are ideal for posters, wall planners, charts or other images and documents that need transporting safely without becoming creased. The robust cardboard tubes are made from spiral wound board, and each is supplied with a plastic cap. Strong, secure, practical, and excellent value for money, they are available in 13 different sizes, in pack quantities from 10 up to 35. Prices include the tubes plus end caps. Click on the link to view our size chart and pack quantities for each, and don’t hesitate to contact us for a quotation today. ‘Megastretch’ handywrap comes in a wide choice of sizes, from small to large and in differing thicknesses and colours – either clear or black. Our popular Megastretch handywrap 110s is ideal for easily and quickly securing small boxes, or for bundling awkward items together for safe keeping and easy transportation. It is compact and space-saving, so can be used in confined spaces, and as the product sticks to itself it leaves no residue. As well as being easy to use, it is highly economical, as Megastretch stretches up to 3 times its original length. It is extremely strong and durable, and can be used for both packaging and storage. Click on the link to view our compact 100mm by 300mm Megastretch handywrap, and browse other sizes if required. Pro-loc gripseal bags offer a highly flexible, reliable product with a great many uses. The bags are resealable, tough, water and moisture resistant and offer superb clarity for presentation purposes. They can be used again and again, and we can even offer custom printing of your company’s branding or logo. They are recyclable, easy to use, available in a huge range of sizes and come in a standard up to a heavy duty range. They are also BondMark accredited, guaranteeing performance for your peace of mind. Choose from plain bags or bags with a write-on panel, in sizes from 1.5 x 2.5” plain bags, up to 12 x 16” heavy duty plain bags, or 2.25 x 3” write-on panel bags, up to 10 x 14” size. Just click on the link to view our full range and measurements. Our selection of handy strapping seals comes in a diverse choice of sizes and shapes, to meet your requirements. Choose from semi-open polypropylene, heavy duty semi-open, serrated polypropylene or extruded polyester strapping seals, as well as steel branding snap-on seals, standard lapover steel branding, or heavy duty steel branding lapover seals. They come in varying sizes and pack quantities, so click on the link to view each option or contact us on 01702 205 999 if you cannot find what you are looking for. Sapphire Packing can supply a full range of clips and hangers, for effective presentation as well as storage for delicate items and accessories. They are cost-effective, neat and secure, as well as looking smart and keeping items organised at the same time. Our belt hangers and sock hangers come in packs of 2500, with tie hangers available in packs on 250, scarf clips in packs of 1000, and scarp hoops in small or large sizes, coming in packs of 500. Speak to us today for a quote. Thermal printers are a must-have for high-quality printing at very competitive prices. They are fantastic for use on a huge variety of different surfaces, and are fully compatible with most software. We stock the Tec B-SV4T, a highly versatile machine that is compact and easy to use. It offers exceptional printing quality at low prices, and is reliable and simple to operate. This is especially popular for transport, warehouse, courier or postal clients. It comes with a LAN adaptor and prints at Up to 127mm per second, with a 203 dpi resolution. The Tec B-SX5 is a larger, more heavy duty thermal printer offering fast and reliable barcode labelling for high volume, quality printing. It comes with Bartender Ultralite labelling software. It is popular for heavy-duty industries such as manufacturing, chemical, pharmaceutical, textile, electronic and telecoms, and prints at up to 203mm per second at 306 dpi resolution. Our professional industrial glue guns are ideal for bonding almost any paper or plastic. They use glue sticks of varying suzes, which Sapphire also supply at competitive prices. They allow continuous dispensing of glue at a controllable speed and with accurate application. Choose from the TEX250, a light duty industrial glue gun that is lightweight and features a soft rubber grip handle and easy to use full hand trigger. Or, we stock the TEC3200, which is a high output industrial glue gun with full standby mode, plug in modules for different heat applications and has an output of up to 3.5kg per hour. We can supply fully-stocked HSE compliant first aid kits – a legal requirement for all shops, offices, warehouses and places of work. They are packed in a durable hinged case with hanging bracket for easy storage and enabling an easy-to-reach location. The standard first aid kit is ideal for 1-10 persons, and we recommend multiple first aid kits to be located strategically around any building. We can supply refills at competitive prices, as well as specialist kits for food handlers or burns. Speak to us today to discuss your first aid kit requirements, and why not also ask about other medical and janitorial products that we can also supply for your business. We stock useful steps and ladders for use in offices, post rooms and warehouses. Our fast delivery and competitive prices make us the number one choice for many companies throughout the UK, and we can also supply additional specialist and safety equipment – just speak to a member of our team today. Our Kick Step features sprung castors and is 440mm. It is highly versatile, easy to use, and can be easily stored or moved on the castors without requiring any lifting. Our platform steps come in a choice of five sizes, with 5 tread platform step ladders up to 10 tread step ladders. The secure, easy to use step ladders are versatile enough to use in almost any warehouse and are lightweight and easily moved and re-positioned. The Access Ladder is heavy duty and easily maneuvered by the wheeled roller. The side handles provide extra safety and security and it comes in a choice of sizes, from 6 tread (144mm) up to 12 tread (2880mm). Click on the link to view each size option in detail. Sapphire’s range of benches are available in nine sizes and are designed to fit any modular range. They are ideal for offices, workshops, garages, warehouses and other working areas. Each bench has an adjustable height to suit any existing benches or tables, and can also be adjusted to fit the user, which can reduce strain and injury risk when handling products. The benches are robust, fantastic value, versatile and offer excellent quality for many years of use. 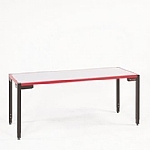 Choose from seven standard shape work benches, in sizes 800 x 800 x 500/900mm through to 2000 x 800 x 800/1100mm, or the 3 level packing bench or 4 level packing benches, measuring 1600 x 800 x 800/1100mm. Click on the link to view images of each size, or contact us on 01702 205 999 if you require more information. If you've any questions about Sapphire Packaging products or services feel free to ask them here.